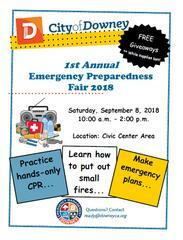 City of Downey Invites you to the 1st Annual Emergency Preparedness Fair at Civic Center Area Saturday, September 8, 2018. The City of Downey would like to invite you the 1st Annual Emergency Preparedness Fair 2018. The Fair will take place on Saturday, September 8, 2018 at 10:00 am - 2:00 pm. Location will be in the Civic Center Area at 11111 Brookshire Ave. Downey, CA 90241.